Desertification puts the health and well-being of more than 1.2 billion people in more than 100 countries at risk, according to the United Nations. The theme of this yearâ€™s World Day to Combat Desertification, held every year on 17 June, is â€˜Desertification and Climate Change â€“ One Global Challengeâ€™. According to the United Nations Convention to Combat Desertification (UNCCD), desertification is a process of land degradation that is partly due to human-induced activities. With their view from space, satellites can track land-use changes that often drive desertification â€“ such as over-cultivation, ill-managed irrigation and deforestation. As stated by the Secretary General of the UN Ban Ki-moon, "The theme of this yearâ€™s World Day to Combat Desertification and Drought â€¦ reminds us that climate change and desertification interact with each other at a variety of levels. They are two major manifestations of the same problem. "On this World Day, let us strive to address desertification and climate change in a synergetic fashion, as part of an integrated approach to achieving sustainable development for all." Desertification does not so much refer to the spread of existing deserts as the creation of new ones, through the reduction of productivity of vulnerable dryland areas by soil deterioration and erosion as well as the long-term loss of natural vegetation. 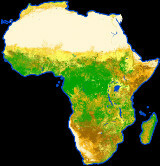 Because dryland desertification can be remedied or even reversed by using appropriate land management techniques, monitoring and forecasting areas most at risk are essential. As well as highlighting any relevant land use change, the view from space can support authorities in getting an overall picture of key pressures on land, such as burned land due to forest fires, erosion processes and their trends over time. This information, together with climatic data and socio-economic information provides an overview of the main causes and effects of land degradation. ESA has been working closely with the UNCCD secretariat for more than five years to develop user-tailored and standardised information services based on satellite observations to assess and monitor desertification and its trends over time. In 2004, ESA launched a satellite-based information service called DesertWATCH to work with three of the European countries most affected by desertification â€“ Italy, Portugal and Turkey. In addition to helping national and regional authorities to assess and monitor land degradation and desertification, DesertWatch also aims to support these authorities in reporting to the UNCCD. 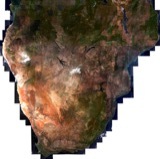 To this end, satellite observations have been combined with in-situ information, processing tools, numerical models and geo-information systems to create standardised and comparable geo-information products that can be used to satisfy UNCCD reporting requirements. The DesertWATCH project is now close to completing its second phase, during which a full operational system has been developed by an international consortium. The DesertWatch information system will provide key public administrations with a large number of indicators and geo-information products relevant to monitoring and assessing the status of land degradation. The ultimate objective of DesertWATCH is to install software tools in the main operational centres of participating countries to help national and local authorities to complete and improve their assessment on land degradation and facilitate their decision making process in their fight to combat desertification. The Eighth Session of the Conference of the Parties (COP 8) of UNCCD will be held in Madrid, Spain, from 3 to 14 September. The COP is the main decision making group of the UNCCD, which meets regularly to further the Convention's objectives. ESA will host a side event throughout the UNCCD COP entitled â€˜Earth Observation Technology to support the UNCCD: the DesertWATCH projectâ€™. DesertWATCH is taking place as part of ESAâ€™s EO Data User Element (DUE).